We live in a time when race and ethnic battles are still raging even though the battle should have been won long ago. It is hard to imagine this happening in our modern age. But how can we stop it? I learned a long time ago that if you want to see change, first start with yourself. When I was about 12 years old, my family took a mission trip to Mexico, close to the border. We did the touristy things but also went to some of the slums to put on a puppet show for children. Since then, I have been to about 6 different countries on mission trips. The majority of these countries were 3rd world. It was easy to view these trips as “I am an American – bringing you the Gospel.” It was not till I was in college that I began to realize more and more that each person that I came in contact with were people in need of a savior just as I am. That we were all equal. Different backgrounds, struggles, and lives. Growing up, my parents taught us to love one another and to treat each person we meet with respect. Not going to lie, sometimes this is difficult but necessary as we seek to share Christ with others. Earlier I mentioned that if we want to see change happen in our culture that it first must start with me. Notice that God did not specify a skin color or ethnic group. But we are all created equal from the very beginning. Equality does not always mean that we will all make the same amount of money or live in the same kind of house or all have the same access to the same lifestyle, although in some cases that would be nice. No, equality, in this case, is that God did not make one skin color greater than another or an ethnic group more valuable than the others. No, God created all in His image to bring Him glory. So how can we begin to change ourselves? 1. Recognize that God created all mankind equally. This is changing our mind and placing a value there for every individual. 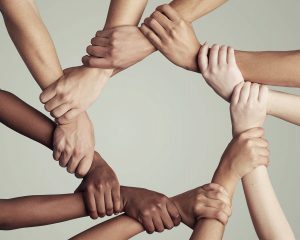 Embrace the uniqueness of each race and celebrating each as a beautiful part of God’s creation. 2. Remember the Gospel is for all. John 3:16, “For God so Loved the World.” The gospel was not just for a few, not just for the Jews, or Caucasians but for all. Our hearts must change with a love for others and the World. 3. Change our attitudes towards others who are different. It is easy to look down on others because they look different, act different or speak another language. In those times, we go back to the first 2 points and change our attitude and how to interact with others. 4. Change our actions. A result of a heart change, the natural flow is that we change our actions. We begin to treat others with respect, we have conversations with people of all races. These actions flow from our lips and into our actions. What are some ways that you have changed in the way you interact with others?